Chopping Block first worked with Phish back around the late 90′s on a number of projects including (but not limited to) Farmhouse, Trampled by the Lamb, The It Festival, Phish 2.0 and later Phish 3.0. Depending on the nature of the project, Phish has always leaned heavily toward the absurd and often messing with conceptual approaches to user interaction. Farmhouse in particular is a fine example of this kind of work and won many awards and honors including most notably the Design category at the first ever Flash Forward festival. 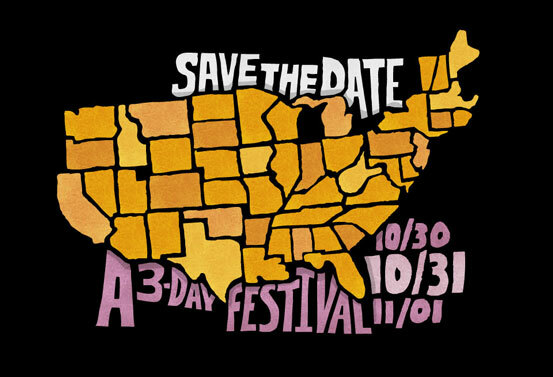 The goal of “Save the Date” was reveal where the long awaited next Phish Festival would be held – the first since the band disbanded back in ’04. This was done by presenting users with an open map of the US and over time remove states not in the running with some kind of bizarre animation. First to go were New Hampshire, Idaho and West Virginia by having what seemed to be some kind of national cardiac arrest and they expired. Many more were to follow with strange eliminations such as getting blown off the map by God himself (image at top) to being flipped to death by a squid-headed Vanna White. As far as we are aware, this is the only place to see the original roll-out of the Festival8 show. Use the date nav in the flash file above to view all 12 eliminations. The festival8 site and identity was also designed by Chopping Block and can be seen here.